What does a biographical dramatic work owe to the real-life people it uses as subjects? If you don't think movies wrestle with this question all the time, then you weren't paying attention during awards season last year, when there commenced a great fuming and fussing over portrayals of Lyndon Johnson in Selma, Alan Turing in The Imitation Game, etc., and whether they were historically accurate. Fascinating people may have fascinating lives, but those lives don't always fit neatly into a 120-page screenplay. Art is art, and we just have to make peace with the fact that sometimes artistic interpretations of real people get messy. Right? 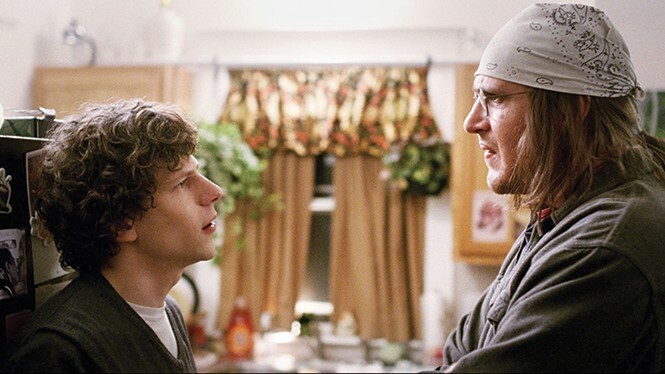 James Ponsoldt's The End of the Tour collides squarely with that predicament—but it doesn't look obvious from the outset. Yes, it does deal with real people—specifically, author David Foster Wallace (Jason Segel) and journalist David Lipsky (Jesse Eisenberg)—further complicated by the reality of Wallace's suicide in 2008. That event frames the movie's story, as Lipsky hears about Wallace's death, and begins rummaging through taped interviews from the five days he spent with Wallace in 1996, assigned by Rolling Stone to write a profile of the suddenly celebrated writer as Wallace wrapped up his publicity tour for Infinite Jest. The dynamic between the two Daves begins with more than a hint of Salieri-by-way-of-Amadeus. Lipsky in 1996 has just published his own novel, and we see him at a sparsely attended reading before he first reads and is blown away by Infinite Jest. The interview, for Lipsky, becomes an attempt to understand what produces the kind of work he isn't sure he has within himself. Maybe he thinks the reflected genius of an interview with Wallace will permit him to reach greatness; maybe he wants to impress Wallace, or just spend time being impressed by him. But he's never an objective journalist. He's already emotionally invested in the outcome. Segel and Eisenberg both capture their interplay beautifully in what is essentially a two-hander built around their conversations. Eisenberg brings a bit of the calculating smarts he showed in The Social Network, alternating between questions that attempt to catch Wallace off guard and moments that show him wanting to be considered a friend. Segel, meanwhile, crafts a version of Wallace who stands out mostly by virtue of his intense desire not to stand out, while also showing his own insecurities in his interactions with Lipsky. As wary as he is of the way Lipsky might try to shape their conversations into his article, Wallace isn't willing not to be a real person, and Segel conveys that yearning for realness in a way that's almost never forced or precious. That "almost" is a fairly huge qualifier, however, as Ponsoldt and screenwriter Donald Margulies fall victim to a trap that seems to be part of Lipsky's own need in that framing narrative: believing that Wallace telegraphed that his suicide was coming. In a scene set just before Lipsky returns to New York City, a dimly lit Wallace stands in the doorway of the guest room, as he tells Lipsky about his darker feelings and that he's "trying really hard to find a way not to let them drive." And during their farewell, Wallace responds to Lipsky's obvious envy with a plaintive, "I'm not so sure you want to be me." Whether the exchanges actually happened isn't entirely the point; it's about what the story becomes once it shifts from a tale of artists sparring over talent and celebrity and respect to a tale of David Foster Wallace the Tortured Artist Who Was Already on the Road to Killing Himself. Perhaps The End of the Tour is playing a subtle game with Lipsky's own point of view and misplaced guilt, and how we're always shaping our understanding of people around the way we happened to know them. Still, that angle ends up leaving a strange aftertaste to a largely effective character study. So yes, we're only seeing one version of a few days in the life of one real man. Maybe The End of the Tour doesn't owe us anything more; maybe it doesn't even owe Wallace anything more. But if "authenticity" is part of that version of Wallace this movie is trying to sell, it's hard not to ask the question.